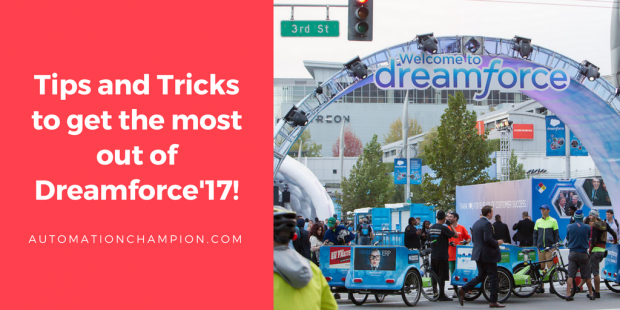 Tips and Tricks to get the most out of Dreamforce’17! It is that time of the year again! The dates for Dreamforce 2017 – November 6th – 9th – have already been announced! We #SalesforceOhana can not wait to hear about new features of Salesforce; and, look forward to learning from what others have been doing. The event gets bigger year after year – with the plethora of acquisitions; sheer number of new products featured at the event are staggering. San Francisco is in the Places to Visit list for nearly everyone. And Dreamforce is an excellent opportunity to get the best of San Francisco combined with the best of technology. 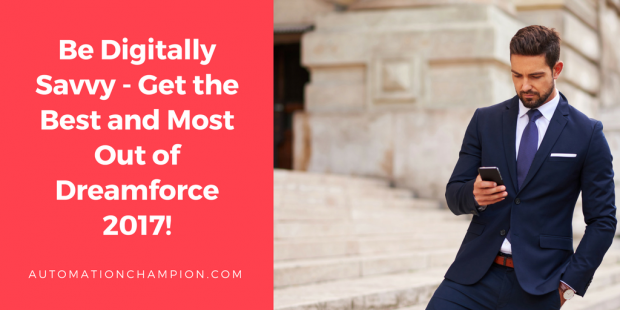 Dreamforce’17 in San Francisco is going to be the place to be for well over 170K (2016 statistics) attendees. I had the opportunity to attend Dreamforce (#DF16) and (#DF15). It does sneak up on you. Therefore, it is good to be prepared! Here are few tips to get you ready for the biggest event of the year. 1. Positive Attitude: – The most important thing to bring to any event you attend – not to mention in life itself! Be open to meeting new people; for, you never know who you will meet. It could be your next partner, client, or best friend! Reach out to the All Dreamforce group in the Success Community, and ask if anyone would be willing to share their room – many people have booked hotel rooms with two beds. 6. Wear comfortable shoes: – Go for comfort. You will be standing around and walking a lot. Wear your most comfortable shoes. In Dreamforce 2015, I almost walked 8 miles per day. I was able to do so, partly because, I walk at-least 10,000 steps per day and I was wearing decent shoes – like ASICS Gel-Kayano. If you are not doing so already, start walking 10,000 steps a day daily; this will tone you for life, not just Dreamforce! The American Heart Association uses 10,000 steps metric as a guideline to follow for improving health and decreasing risk of heart disease – the number one killer of men and women in America. Read the rest of this entry!